Valentine’s Day is the one day of the year that is meant to make you're significant other feel special. When you think about how great she is for all she does for you, you know you must get her the perfect gift. 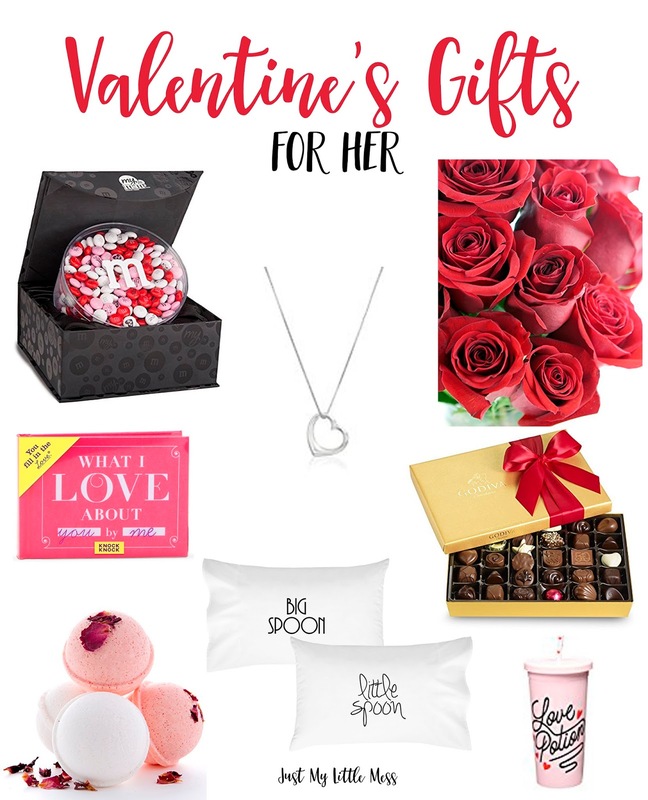 This year, make her Valentine’s Day special with one of these Valentine’s Gifts! Long Stemmed Roses Highest quality flowers, fresh from the farm shipped from farm your loved one! She is going to love these. Big Spoon Little Spoon Couples Pillowcases Couples pillowcases with "Little Spoon" on one and "Big Spoon" on the other. You can now clearly identify who will be big spoon and who will be little spoon. Fits Queen/Standard size pillow inserts. The art of Appreciation Gift Basket Nothing says I love you quite like chocolate. The Art of Appreciation gift basket is fit for a queen featuring indulgent Art d’ Moi Chocolate Truffle Spa products, a heart sampler gift box with four chocolate confections, gourmet cookies, and cuddles the bear. Sterling Silver Heart Necklace It may be too early for a ring, but it is never too early for jewelry. All women enjoy some accessories. Made with sterling silver this necklace makes the perfect gift for Valentine’s Day! Bath Bomb Gift Set If you haven’t gotten your pretty lady a bath bomb set, she is going to be in heaven with this. Give your women a treat for all her senses. These homemade bath fizzers contain 4 bath bombs including Rose and Gardenia scents, soap and bath salts. Milk Chocolate Dipped Oreo Cookies Who said the easiest way to a woman’s heart isn’t through her stomach? These delectable treats are sure to make any woman happy to have you. Nothing says love quite like chocolate and then more chocolate. Knock Knock What I Love About You Fill in the Love Journal Women really want to know why you love them so much. In fact, it may be a topic of discussion from time to time. This little book contains fill-in-the-blank lines that let you tell your loved one what you love about some aspect of them (Don’t forget to fill in the blanks). Personalized Gold Bar Necklace Personalize this necklace with a reflection of your love, your name, or a favorite saying. Of course, a simple “I love you” is a great way to personalize this gift. Godiva Chocolatier Valentines Chocolate Tied with red ribbon, our iconic gold box is a joyous gift for any loved one. Inside includes milk, dark and white GODIVA chocolates. Yummmmm! Love Potion Tumbler What girl doesn't love sipping water from a super cute cup? Be careful, this cup is instant crush inducing! Ladies what gifts are looking for? Share your gift suggestions in the comments below to help these guys out this year!